Let’s take a look at our recommendations for some of the best liquid fertilizer nutrients that you can use for hydroponics plant growth. 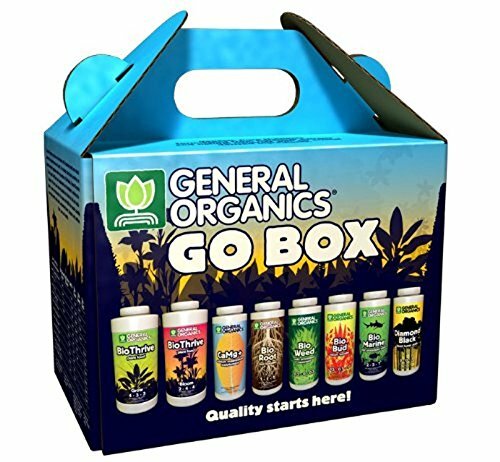 The General Hydroponics General Organics Go Box system provides a complete solution for hydroponics growers everywhere. Each Go Box contains the patented three-part system for blooming, general growth and maintenance of a hydroponics system. You will get 16. oz of BioThrive Grow and BioThrive Bloom, plus a massive collection of eight ounce samples of all the current plant supplements available under the General Organics range. You will be able to see for yourself how each of the special supplements will affect your plants so you can create the perfect combination for your chosen crops. See our General Organics Go Box review here. The Fox Farm Liquid Nutrient Trio Soil Formula is one hydroponics nutrient trio that can be used not just for your hydroponics system but also for conventional soil gardens. 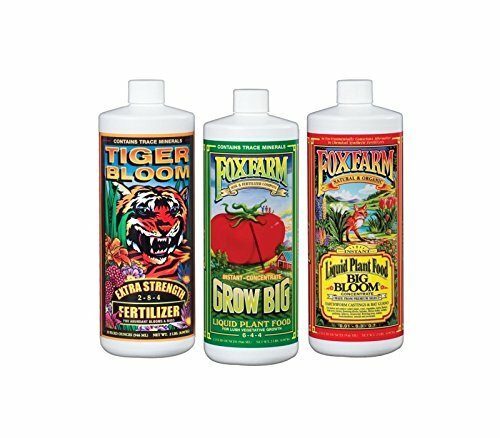 Each Fox Farm package includes one Big Bloom, one Grow Big and one Tiger Bloom solution each. Each bottle has a total of 32 oz. of plant food, ready to apply to any system. The key to this system is the sequential application of the liquid fertilizer to an existing system. The first one that goes into the nutrient reservoir is Grow Big. This will help germinate seeds and also provides the initial stock of nutrients. When you begin seeing buds forming on your crops, immediately apply the Tiger Bloom solution to encourage the flowering stage of the plant. And finally, add the Big Bloom last for maintenance of the system and the final solution will help carry your crops to its maturity. See our review of the Fox Farm Trio Soil Formula here. 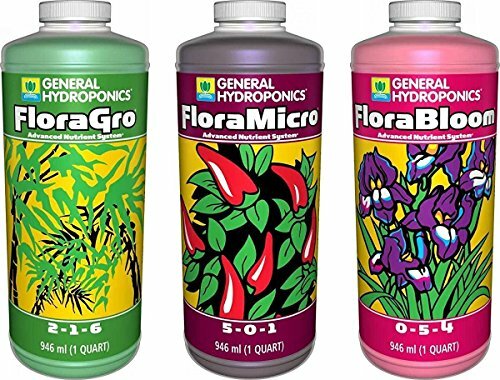 The General Hydroponics Flora Glow, Bloom, Micro Combo Set features a three-tier system that should also be applied to any hydroponics system in a sequence. The Flora series is known for stimulation the production of essential oils, increasing weight of fruit and also improving the flavor of crops. Utilizes the patented Building Block System of nutrition. The AeroGarden Liquid Nutrients 1 Liter provides complete nutrition for plants in an easy to mix form. 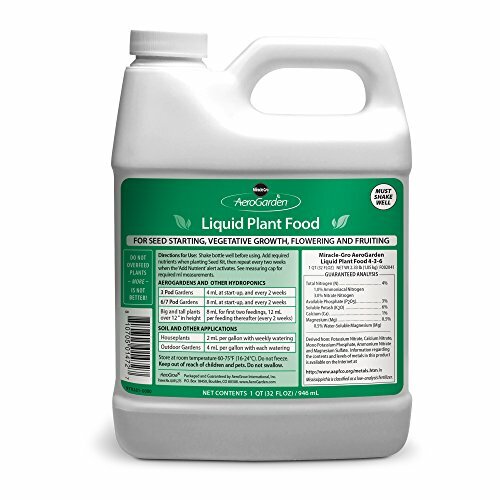 This liquid fertilizer is ideal for all Miracle-Gro AeroGarden units and can provide sufficient nutrients for at least one hundred feedings. This solution can also be used for indoor plants and crop. Simply combine four to eight ounces of the solution to one gallon of water and apply the water normally to houseplants. 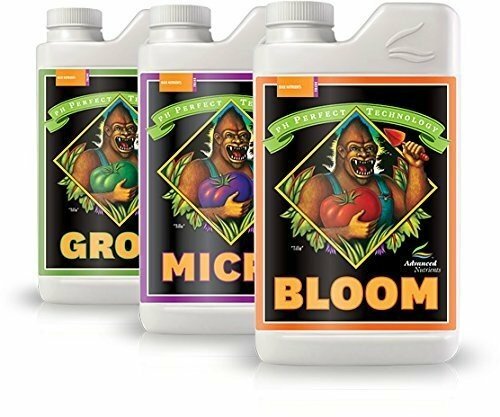 The Advanced Nutrients Bloom, Micro and Grow Pack is a premium nutrient base package that was meant to provide the best possible nutrient ratios to crops upon application. Can also be used in conventional soil setups. Use for high value crop systems that require extra care. 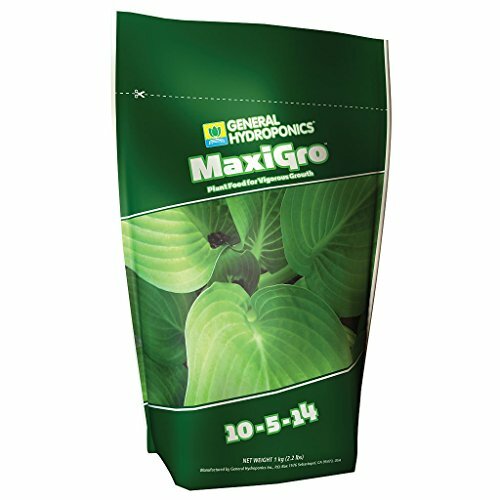 General Hydroponics MaxiGro for Gardening is a two pound bag of complete nutrients for soil and hydroponics gardens. Ideal for cultivating seedlings and cuttings to their vegetative state. Some thirty or forty years ago when hydroponics was still in its infancy, people were mixing their own nutrient solutions based on what they thought was a good mix for hydroponics systems. While it worked, the process of finding the right ratio was largely trial and error. While it is possible for you to succeed in hydroponics despite the inherent difficulties of a trial and error system of mixing the nutrient solution, why put yourself through that kind of stress when you can use hydroponic fertilizers? Hydroponic fertilizers at the very minimum, provide the a balanced mix of nutrients for plants so that they would reach maturity easily in a non-soil environment. Just measure some fertilizer, add them to the water and watch Mother Nature take care of the rest for you. Choose a hydroponic fertilizer based on your needs as a grower (what you are comfortable with) and what your crops need. Some crops require more calcium, phosphor, nitrogen, etc. First do some research about the crop type that you would like to cultivate in your system and then research the nutrient levels in the available fertilizers that you can purchase. Chances are there will be mild variations in the nutrient requirements between plants and while these variations are often small, giving your plants the right type of nutrition based on actual nutrient levels of the plants is so important. Always check the fertilizer’s label before deciding to buy it. There are two main classes of hydroponic fertilizers: powdered and liquid. Plant nutrients such as nitrogen and calcium already come in powder form and so what manufacturers do is they combine the different plant nutrients in specific ratios to get an adequate level for hydroponic plants. Liquid fertilizers on the other hand, all begin as powdered nutrients but they are combined with water and other surfactants so they can be mixed easily with water in the nutrient reservoir. If you are going to ask us which fertilizer type has a slight edge over the other, we might say that liquid fertilizer has a slight edge. Why is this? It has a slight edge simply because it is already in liquid form and can be combined easily with water. In terms of availability to the water, it’s already highly available and the chances of accumulating lots of residue because of liquid fertilizer is quite low. On the other hand, solid fertilizer in the form of powder can be dissolved in water but it may sometimes leave residues that may accumulate in the piping, drainage and other conduits inside your system. We really recommend trying both types of fertilizers so you can see which one has the most potential because each hydroponics system is unique and with the added variation of crop type and number of crops, there is no direct answer to the question at all. You need to apply the fertilizers first and then see how your crops respond to them. There are actually a ton of information in books, agricultural magazines and journals about the right nutrient mix ratios for hydroponics systems. If you really want to concoct your own solution, then by all means, do so. However, there are a couple of difficulties that stand in the way of creating the perfect batch of nutrients for hydroponics systems. The first difficulty is acquiring the materials themselves. The raw materials for nutrient solutions are not always widely available and based on the current state of the market, minerals have become over-harvested through the years and as a result, the price of these raw materials have also reached their peak points. The second obstacle is the risk of either under-delivering or over-delivering certain nutrients to your plants. In both situations, the plants may die and you may end up with barren grow trays and a mostly toxic, unstable nutrient reservoir that you may have to drain complete or at least buffer with pH buffering solution in order to use again. These are the main drawbacks of experimenting with the nutrient reservoir. However, if you do get things right, you may be able to come up with a special mix that works extremely well with the types of crop that you really love cultivating in your hydroponics solution. Again, it is a big ‘what if;’ it all depends on how your crops actually respond to the nutrients that you put inside the system. Here’s an incredibly important aspect about hydroponics that you should never forget: the water inside your nutrient solution isn’t there just because it’s providing nutrients to your plants, or hydration. The water in your hydroponics system is also the home of numerous microorganisms that all help keep your system stable and working. Over a period of time, say, six months, the water in your reservoir will already have a good supply of beneficial bacteria that prevent harmful fungi and algae from growing and also help support the growth of the plants to full maturity. So when it comes to changing the nutrient solution, we’d like you to take the more conservative route. Add water only when needed and when you’re reducing the water in the system remove no more than 25% of the original level of the water so you do not harm the natural balance of your system. Plant ecology in a hydroponic system is extremely fragile so it would help greatly to take the conservative route in most cases. In the current state of manufacturing, we can confidently say that synthetic nutrients now deliver equal or even higher results than organic nutrients. Just so there is no confusion, “organic” her refers to nutrients derived from sources such compost and animal waste. The main advantage of using synthetic nutrients is you will get the same measure of vital minerals whenever you apply some to your hydroponics system. There would be little guesswork and in terms of results, you will generally get better results precisely because there will be no under or over-delivery of nutrients. EC Levels – EC levels refer to the electrical conductivity of the water in nutrient solution. Fertilizer Type – This can either be powder or solid for or liquid form.